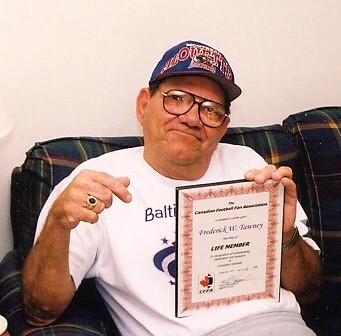 In 1999 the CFFA honoured a FAN who has shown great support of our Canadian game with a LIFE MEMBER AWARD. The CFFA has long believed that fans deserve recognition as much as, if not more than players and coaches. They play the game, but it's the fans that are the life's-blood that keep all the sports alive. Fred Tawney, who lives in Baltimore, was a huge fan of the Baltimore Stallions. He would be seen at virtually every Stallions practice along with his brother Louis. To this day he is affectionately known as "Old Timer" by former Stallions players, and many are good friends with him. Even though the Stallions left, he never lost his love for the team and the Canadian game. As his health allows, he still comes up to Canada to watch CFL games and cheers on his favourite teams.